I happened to check the Hillside Shop page an hour ago, so my order for both has already been placed - trouble is, you've now set a standard, so if they don't arrive tomorrow I shall be disappointed! I'm working from home today, so can play the first two CDs out loud (instead of using headphones in the office) - they really are wonderful. Thanks to those staggeringly efficient folk at Hillside Music, I ordered the new CDs yesterday afternoon and received them in the post this morning. Just as beautifully produced as the first two CDs, and with even more fascinating annotations from Pete and Clive. Incidentally, I've been playing them on my PC this morning while supposedly working, and I was struck that the Gracenote database categorises 'Beware of the Beautiful Stranger' as 'folk' (and the earlier version I have on my iPod is categorised, weirdly, as 'blues'), 'Driving Through Mythical America' as 'Unclassifiable', 'A King at Nightfall' as 'alternative', and 'Secret Drinker' as 'rock'. The other two weren't recognised yet, so I suppose there's time for us to designate them as 'classical' or indeed 'hip hop' if we want. For the recent albums, I'm tempted to use the classification 'post punk'. Yes, the speedy delivery record has been maintained! Ordered yesterday, arrived today. Only had a chance to listen to AKAN so far. It's been a while since I listened to the entire albums, and there are some gems in there I had almost forgotten about. I think the blues one is the default Mike - so for anyone typing in titles who can't be bovvered (isn't sure how etc) to categorise it's what gets left on. I've tried setting the genre to "Hard Listening" in the past, but it always seems to be rejected! Hi Andrew - I do hope that the reissues will live up to your expectations. I'm pretty hopeful that they will. For those who are intending to purchase from the Hillside online shop, I must apologise for the fact that Hillside Warehousing and Categorisation have not yet received stock from the Demon demons. This is, of course, the place to learn when this position is rectified, but in the mean time Amazon, Play.com, HMV online and the like will be anxious, I am sure, to fulfil your desires. attention to it: all the reviews would question its absence and any interviewer worth his salt (and who had done his homework) would commence his interview with "Why aren't you re-issuing Live Libel? ", thereby potentially giving it an unwarranted and unhelpful emphasis. As it is, the space to provide extensive new notes for every album and every track has given Clive and me have the opportunity to put the album properly and carefully into context and to make clearer than ever before our attitude to it and to the individual songs on it, without seeming as if we're trying to deny its existence. Besides, there are in any case some aspects of the recordings and even certain of the songs that we wouldn't want to see necessarily consigned to outer darkness for ever. Finally, while perhaps not many of us would be happy to describe ourselves as 'completists', it may be that some of us would nevertheless be happy to describe ourselves as 'collectors' to some extent at least , and if you're attempting, as Val and Demon are, to put together something like a 'definitive edition', it's arguably inappropriate to be exercising this kind of critical judgement. And, as Val says "I don't really want to issue 'less' than See For Miles did, if you see what I mean." Well, I for one don't think there is any reason to eschew or reject "Live Libel" - maybe not a 'lost masterpiece', but actually because we didn't all lose sight of it. . OK, some of the tracks are well past their sell-buy date, but many are eternal (you are gods, after all....). "Errant Knight" builds up perfectly and the lyrics are exquisite (just listen to them, folks). "Black Funk Rex" and "Rattlesnake Rock" still seem highly pertinent, and James Taylor's early phase still seems to warrant "Sheer Quivering Genius". As for "Uncle Sea-Bird"... still worth a listen. In other words, a worthy part of the James/Atkin canon, and I look forward to reading the notes on the re-release (the only crib here is why - oh why - didnt't you include the sleeve notes from the original LP? Two pages of sheer quivering brilliance which deserve to be maintained for posterity). But could you please get the final CD on the data base? Took me half an hur to fill in all the details manually so I could get it right on my iPod (and ( had to download all the artwork from Amazon UK. And finally - and more importantly - what about the sound? I've only listened to the first 2 CDs so far, and assume that the balance - Pete on the left, the other musicians spread out to the right - is as was intended. But the tonality ....? It's warm, very warm, verging on dull. Unobjectionable, but surely not as incisive as the original LPs (which I'll get out tomorrow for a comparison). I would draw attention in particular to "No Dice", where Herbie Flowers' guitar solo fades into the background, when it should jump up and bite you. Did something go wrong, or was this what Pete originally intended? I think we should be told. You might have something there, John. I've just compared for the first time the SFM and Edsel versions of 'No Dice' and I can hear the difference. Right from the start the SFM sounds more alive -- you can hear tape hiss (always a good sign that the track hasn't been 'over-CD-mastered') and the creak of the drum stool at extreme right. Pete's vocal reverb (also at right) is more noticeable, and the fizz of the kit between beats. Next I should compare my own vinyl-CD dubs from before SFM, with no dynamics processing, but I can't seem to find them at the moment. why - oh why - didnt't you include the sleeve notes from the original LP? The only reason, John, was space. The booklet is the maximum size that can be accommodated in the slimline double case (Val tells me that only Elvis Costello in the Demon catalogue has been granted this much documentation), and to include the original notes would have meant sacrificing probably most of the pics and scans. You'll find that Val has included a note explaining and apologising for this. We had to make a decision, and I'm afraid that since the Rudolph Regulus notes are available elsewhere we thought it preferable to include the unseen material, which incidentally also helps to give the booklet some visual variation, to make it less of a solid wodge of text. Don't know anything about databases for iPods, but if you're looking for cover artwork I think (with respect and modesty) you'll find the images in our discography (click for the 800px versions) are better than anything Amazon has to offer. Oh yes, and here's the link to Clive's original Live Libel sleeve note. Yopu want to be careful Alan Parker doesn't jump out and bite you as it was he who played guitar on this track. Unless you mean bass guitar of course. I just popped the wav extractions from the SFM and Edsel cds into Sonar to look at them more closely. One obvious difference is that the SFM one is more compressed (at highest levels SFM is slightly louder but for quieter bits SFM is quite a lot louder). The other is that the SFM one is 2.7 seconds longer! (measured from the first piano beat to the "G" of the last "ago"). One obvious difference is that the SFM one is more compressed (at highest levels SFM is slightly louder but for quieter bits SFM is quite a lot louder). Thanks for that, Simon -- I'd hoped to get around to doing something similar. Could it be that the SFM version retains the original dynamics but the Edsel one is expanded -- the low levels have been stretched downwards in an attempt to remove master-tape hiss, and with it other low-level artefacts? Unfortunately those other artefacts include a lot of what gives a recording atmosphere, and their removal from original recordings, rather than the 16-bit coding, is (IMHO) responsible for much of what many people disparage as 'clinical CD sound'. My first purchase of Steely Dan CD reissues suffered in this way, and not until I compared them with the vinyl did I realise why they weren't grabbing me: most of the reverb and much of the instrumental delicacy had just vanished! You hear it on old movie soundtracks too: here the 'noise gating' expansion often has a sharp threshold, and quiet dialogue around that threshold level suffers from whole words or phrases disappearing. You turn it up louder to hear, and then the train arrives, or a gunshot, and you're blown out of your seat! It could be that CD remastering of analogue recordings is still suffering from that obsession to eliminate all hiss, and that today's dynamics processors only make it easier for the mastering engineer to damage the listening experience. Still, all this casts only a light haze, rather than a dark cloud, over the splendid wonderositude of this current reissue. Very happy with the reissue and especially the annotations, which I spent a happy evening reading yesterday. Still, I've just been listening to the opening bars of the song "Road of Silk" in the SFM and Edsel versions as transferred to my iPod (256 kbps AAC encoding is pretty much indistinguishable from the original, at least to these aged ears). I always felt the whole of the original vinyl record had a dull sound - bass-heavy and lacking sparkle. The SFM CD went a long way towards redressing the balance, but the Edsel version has much more of the vinyl sound - and in this case that's not a good thing. It sounds somehow bland and smoothed-off - whether as a result of limiting, countour-shaping or whatever I have no idea - you're the expert. The funny thing is that recording engineers are often accused of jacking up the presence range to compensate for their loss of hearing as a result of too many over-loud gigs. Maybe they're now all very conscious of the problem and over-compensating? Thanks, Pete - of course I can always get out my original vinyl LP and read along to the music. Indeed, I might even play it! Just playing about a bit more with extractions from the two CDs, I expanded just the "g" of that last "ago" in No Dice. The waveforms seem to show the SFM track had the gain set higher, but then had a hard limiter on to avoid overload, meaning you lose the efect of the louder parts of the music. I've put jpegs of the same 6 millisecond chunk of the right channel of the two at SFM and Edsel. This *may* have been something to do with the way I extracted the audio, but I don't think so (same method used for both). 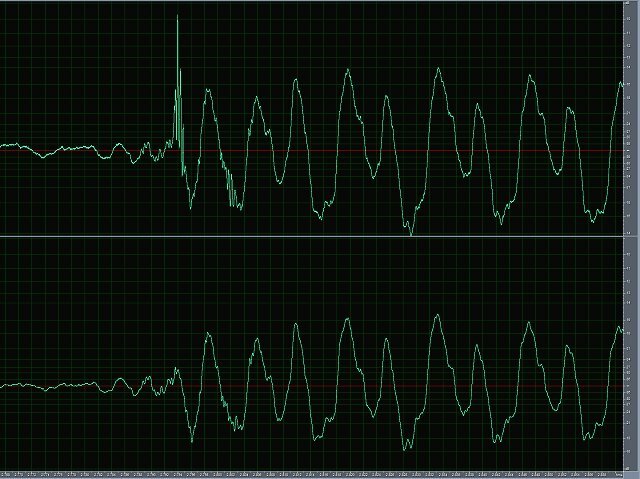 I've got to agree re your waveforms: the SFM seems to be set significantly (some 3dB) higher in gain, at this instant at least, with the top 2dB or more of the low-frequency palatal bump of the 'g' hard-limited (clipped, even) out. (Does this 'g' really hit the buffers?) But note how the peak-to-peak amplitude of the succeeding higher frequency breathy components is *much* greater on SFM than on Edsel, far more than would be accounted for by any difference in static EQ we can hear. Of course with dynamic noise-reduction processing (which I believe I can detect) a waveform snapshot tells only part of the story: the lower levels of the HF components are suppressed to a greater extent than the high level (all frequencies) and low frequency (all levels) stuff, the extent depending upon the instantaneous energy distribution (which changes at a syllabic, or beat, rate) so that (psycho-acoustically, they say) we don't notice it happening. Possibly. Looking closer, I can confirm the differences are neither just level nor just EQ. I've copied the R channel of SFM in place of the L channel of EDS to create a composite. And for each view here (in Adobe Audition, a.k.a. Cool Edit Pro) I've realigned the two channels in time to compensate for the higher speed of the EDS version. 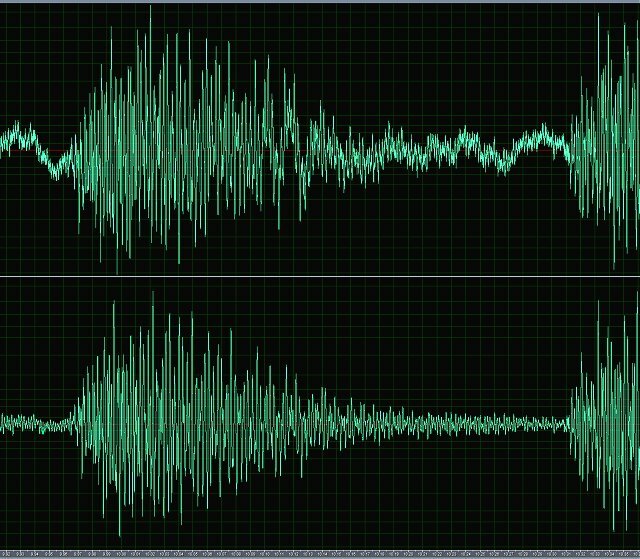 Yes, SFM (top) is 2.5dB higher in level, but look at that percussive transient at the start -- vanished in the EDS version (bottom). 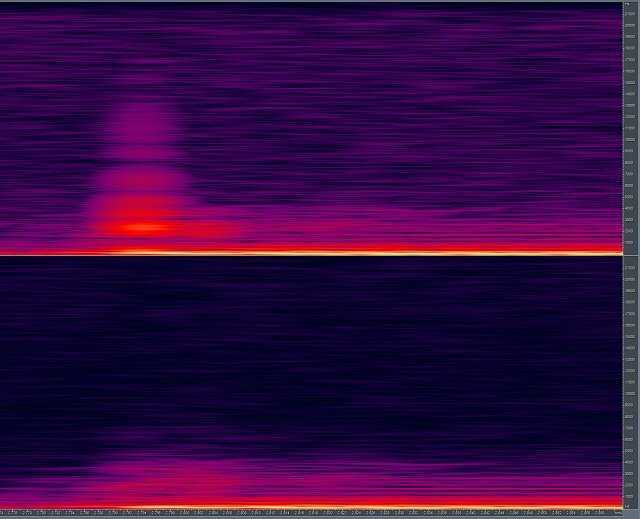 You can see the lower level of noise (background brightness) across the audio band (LF to 21.5kHz) in the EDS version, but all the HF energy in that pluck has gone. Look also at the 'creak' (which I'm guessing is the drum stool) around the fifth note. 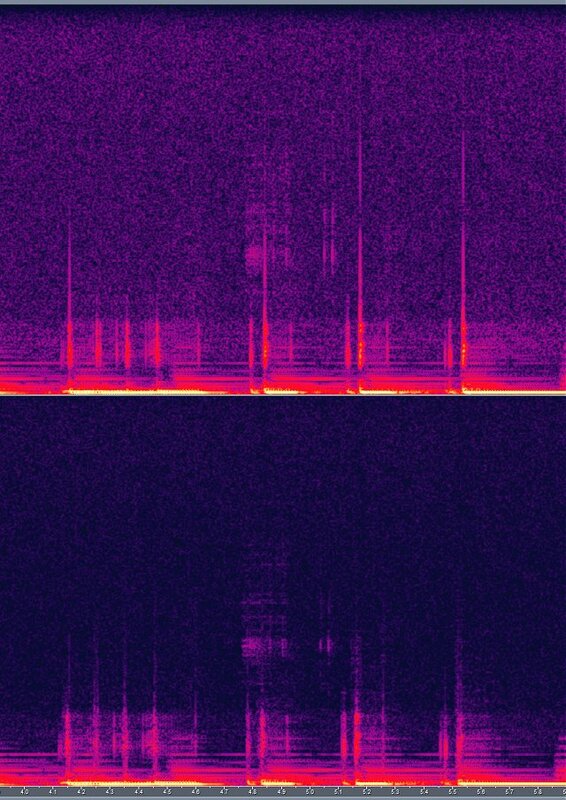 It's a series of clicks around 8kHz. It stands out more clearly to the eye in the EDS (bottom) version, but the ear is better at ignoring the background noise -- the creak is more clearly audible in the SFM print. Where the signal is unpredictable (noise-like) you don't remove noise without also discarding some signal. Of course, musicians might argue that that's not meant to be there, not part of the music, which is fair enough. All the same, some of what is lost (the bass plectrum transient) is meant to be heard. This is just one of Pete's staccato piano chord 'stabs' at the beginning. See how (bottom) it decays to (virtually) nothing before the next one comes along. That 'atmosphere' at top is audible. This is the word "ice". SFM (top) ran the peaks right into hard limiting at 0.5dB below full scale, with ugly consequences. EDS performed a soft limiting (or compression) process on the peaks, to keep them just (0.1dB) inside full scale. 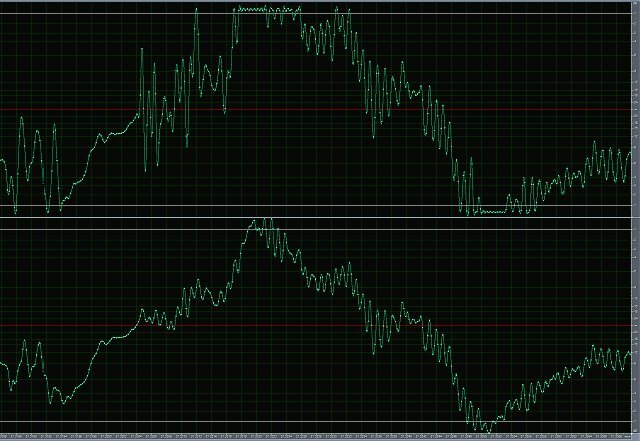 This view also illustrates the softening of the EDS sound -- look at the spikes lost on the rising edge, and the loss of amplitude of the sibilant on the falling edge: the former due to 'smart' dynamic noise suppression, the latter possibly to static EQ. To sum up, I believe the differences are due to EDS's use of a more sophisticated dynamics processor, with noise reduction options probably set to default values that are a little too severe for our ears. Couldn't agree more. And thanks to Steve for doing the analysis and confirming what I thought I heard - that the new CDs are well smoothed off. Must say I hadn't noticed that the SFM version had the top of the dynamic range lopped off, but that does actually seem preferable in listening terms. If you watch "Masterchef" you'll see that John Torode and Greg Wallace constantly criticise amateur chefs for not tasting their dishes and adjusting the seasoning appropriately. Surely it's not to much to ask (beginning to sound a bit tabloid here) for remastering emgineers to do the same? Play the original, if only for a few bars, then tweak the parameters of the new version until it's at least as good as the original? In the case of the vinyl "Road of Silk" I found it took a 6-9db boost on the treble on my old system to get it sounding reasonable - and that was in the days when tone controls were supposed to be a no-no. SFM - however they did it - got somewhere back to what I guess Pete intended.